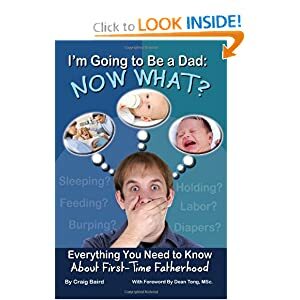 Craig Baird has written several books on parenting, including I’m Going To Be A Dad: Now What?, The Complete Guide To Investing in Index Funds, The Six Sigma Manual, A Complete Guide for Single Dads, as well as several short stories. When I started out on these books on fatherhood, I had no experience with being a father. I wanted to be able to present a fresh approach to fatherhood through my research and I thought that if I could learn about being a father, without experience, my readers would be able to as well. I learned so much through writing this book, and I hope my readers learn just as much from reading it. It cannot be underestimated. That is not to say that a child cannot grow up to be completely healthy in a single parent household, but the role of the father is very important, as is the role of the mother. Especially in young boys, their first role model is their father, and the actions of the father lay the groundwork for how the boy is going to act as they grow up. For both young girls and boys, the father is seen as a protector and there is a great deal of respect for their father. Through playing, talking and listening to his children, a father can show them that he is always there for them when they need him. Be there for them when they need him. A father needs to be able to sit and listen to his children and always have time for them. It is also important for the father to show confidence in his children and their decisions. Encouraging them and helping them reach their potential cannot be underestimated. It is also incredibly important for a father to be a role model for both their children. The father needs to show their children how to act through their own actions. When a child sees their father yell at a waiter/waitress about an order, the father is setting a bad example that the children will begin to emulate as they get older. Being a bad role model is a big one, as I mentioned. However, one of the biggest mistakes a father makes is not always having time for their children. Children are young only once and often when a father is gone during the formative years, there is resentment in the teenage years and beyond. It can also be hard for a child to respect their father if their father is never around. However, there are other errors that a father can make including ignoring their children (even accidentally), not encouraging them and not having time to talk with them and listen to them. I think that is exactly right. We all have the best of intentions when our children are born to be fathers who are always there but life and work often gets in the way. Fathers need to juggle working to provide and being their for their children and it is not always easy. Your child is only five once, they only have a first day of school once, they only walk for the first time once and so on. Those moments can never be recreated and for a father who is often away from home, it is a hard thing to deal with. I think that children born in the 1960s and beyond have all had pretty good lives. Our standard of living has gone up, education has improved and leisure activities have greatly increased. Children today have better lives than those that came before them but that does not mean they need to be toughened up. Yes, rough times do help make a person strong and capable, but it is just as easy to have an easy upbringing and be strong when one gets older. Resilience and strength does not come from experiencing tough times, it comes from gaining confidence through parents encouraging their children. Confidence “toughens” a person up and makes them believe that they can achieve anything and defeat any problem. Many parents may feel that kids today are too smothered with love, and while there are some extreme examples (banning tag in schools because it may hurt feelings of those tagged) of making sure everyone is happy, I would say that this current generation of children is the most balanced ever. Most children get a balance between discipline and love and that helps turn them into healthy individuals who succeed in life. As with anything, there needs to be a balance. You cannot be too hard on your children or they will come to resent you, and you cannot be too easy on your children or they may come to rely only on you and not themselves. Balance is key. A father is not only a friend, but they are a disciplinarian, and it is sometimes a tough balance to maintain.